Two thousand years of Christian anti-Semitism provided the “nitroglycerin” for the “dynamite” of the Final Solution: “The Nazis simply had to light the match,” Gabriel Wilensky writes. His accessible first book details the entrenchment of anti-Semitism throughout every era of Europe’s religious history since the birth of Christianity. This concise narrative is punctuated with pictures, charts, and lists of anti-Semitic papal pronouncements spanning five hundred years. 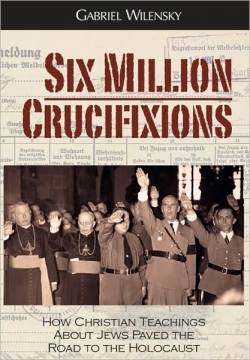 From Augustine to the crusades, Inquisition, and Reformation, Wilensky documents the wellspring of hatred on which Hitler and the Nazis drew to implement the murders of two-thirds of European Jewry. By the eleventh century, anti-Semitism was firmly embedded in the theology of the Catholic Church. Jews were depicted as “still murdering Jesus in Jerusalem in the permanent present tense of the liturgy repeated year after year,” Wilensky explains. From the Easter liturgy—to which the prayer for converting all Jews has been reinstated by the current pope for optional use—to the passion plays that were a fixture of medieval life, European Christians learned that Jews were a dangerous threat to all they held dear. In 1205, Pope Innocent III wrote that “the Jews, by their own guilt, are consigned to perpetual servitude because they crucified the Lord.” This false charge, based on anti-Semitic revisions of the Gospels that minimize the role of Pontius Pilate, laid the groundwork for accusations that Jews used Christian blood in their rituals and justified countless acts of anti-Semitic savagery. Six Million Crucifixions places medieval drawings next to Nazi propaganda to emphasize their similarities. There is a 1935 picture that shows German peasants examining a roadside sign that proclaims, “The father of the Jews is the devil.” Others show Catholic bishops mingling with Nazis, saluting Hitler, and administering church services to German soldiers. Hitler, a Catholic, was also fond of quoting Martin Luther: “Next to the devil you have no enemy more cruel, more venomous and virulent than a true Jew.” He also drew on nineteenth-century anti-Semitic precedents such as the Dreyfus Affair, clerical support for pogroms, and the rebuilding of the Roman Jewish ghetto by Pope Pius IX. In 1938, Pope Pius XII remarked that Jewish “lips…curse” Jesus and their “hearts reject him even today.” After the war, members of the Catholic Church and the Vatican actively aided the escape of Nazi war criminals, even allowing them sanctuary in churches. He never recognized the state of Israel. Although Americans and Europeans may be tempted to forget historical injustices in the name of today’s tolerance and diversity, Wilensky’s writing is a lucid, concise reminder of why it is important to remember how deadly religious bigotry can be.